By Daniel Horowitz--Oscar-winning actor Jon Voight learned about anti-Semitism and intolerance at an early age, and even though he was only eight, he didn’t like what he learned about the dark side of humanity. The non-Jewish actor, best known for his roles in such iconic films as Deliverance, Midnight Cowboy and Coming Home, for which he won the best actor Academy Award, and the father of actress Angelina Jolie, is proud to call himself a friend of Israel and of the Jewish people. “My father, Elmer Voight, was the golf pro at Sunnydale, a German-Jewish Country Club in Scarsdale, New York,” Voight told me during a telephone interview from Los Angeles. “Because of that connection to the members of the club when I was very, very young I learned, first-hand, a bit about anti-Semitism. These wonderful people were not allowed to join other country clubs at the time, so they gathered together and built their own club, I learned a lot of strong lessons from Dad and I learned about the insanity of anti-Semitism. “Israel has a deep meaning for the world, and I believe it is setting a standard for the world,” says Voight. “The Jewish people down through the centuries have given us so much. I’ve been enamored of the great legacy of all the great people from the time of Moses down to the present. There is so much the Jewish people have contributed – and continue to contribute - to world information and knowledge, the sciences, medicines and the arts as well. I’ve fallen in love with that legacy. Then, of course, there is that land that has been the basis – the landscape of all of that history is, of course, Israel. It’s very important to the history of the Jewish people. The Balfour agreement was the basis to provide the Jewish people with some sort of haven where they can be safe, and where there would be no attacks. I believe that is what the Balfour declaration states, that the Jewish people have a homeland.” Voigt, who has been to Israel on a number of occasions, spoke about one emotional visit he recently made to the city of Sderot, one of the areas in Israel’s periphery, which receives funding from UJA of Greater Toronto. “Sderot has been attacked by thousands of rockets over the years, and it is part of their daily lives that they will be attacked. Nobody in America or Canada would ever stand for even one rocket landing in their towns, indiscriminate bombings everyday on their children. The remarkable and beautiful people of Sderot refuse to leave, simply because it’s their home. They refuse to give into the terror. The people of Sderot have a system, whereby you have literally seconds to get to a bomb shelter shelter, which they have all over the town so that they can safely get out of the way of these rockets. And the children are growing up with this war zone – post traumatic stress disorder – many of the children of Sderot have it. It’s an appalling, tragic situation, yet, on the other hand; it’s very deeply moving to see the bravery of the residents of this little town. Despite their bravery, you see the weight that they are carrying, etched on their faces. Sderot is a metaphor for all of Israel, and the world doesn’t rise up to protect it. 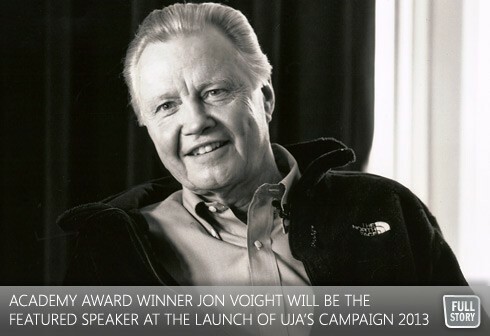 It’s a gross injustice.” The Campaign Launch featuring Jon Voight will also include a musical performance by Hagit Yasso, winner of Kochav Nolad, Israel’s version of the popular TV show, American Idol.